« Construction works will soon commence on the High Speed Rail Line (HS2) which will be less than1500 metres from the nearest house in Sulgrave. Visit Sulgrave Manor on Thursday October 12th to find out more. In 2016, the Council published a consultation document inviting comments on the various options then under consideration in respect of these matters. Numerous responses were received, including those from Sulgrave Parish Council. After due consideration of these responses, the Council has now published its Pre-Submission Draft Plan for Consultation. See next page for further details, including links to the relevant documents. Click here to access the South Northamptonshire Local Plan (Part 2) Pre-submission Draft for Consultation. The policies and proposals of the plan are legally required to accord to the to the provisions of the National Planning Policy Framework (NPPF) and give effect to the objectives of The West Northamptonshire Joint Core Strategy Local Plan (Part 1). This Joint Plan sets out the long-term vision and objectives of the whole area covered by Daventry District, Northampton Borough and South Northamptonshire District Councils for the plan period up to 2029, including strategic policies for steering and shaping development. It identifies specific locations for new housing and employment and changes to transport infrastructure and other supporting community facilities, as well as difining areas where development will be limited. In these villages there will be scope for very limited development within or adjoining the village confines of the settlement (my italics) where this is limited to meet any identified local or specialist need or where there are opportunities for the redevelopment of brownfield sites which will result in a positive environmental improvement. However, the plan makes clear that any application including the development of open market housing on sites outside the village confines will need to be accompanied with evidence that alternative sites within the confines are not suitable or available for development. In addition, the application will need to be supported by a robust local objectively assessed needs study, undertaken in conjunction with the Parish and District Councils over an appropriate period. The Council’s proposals for the extent of the confines in Sulgrave are set out in Annex 8 (1). The plan in the annex is rather small and the confines line somewhat difficult to discern and so I have prepared the following three maps to show it in more detail. Since the publication of the Options Consultation Document, the Council has made a number of small amendments to the confines line for Sulgrave and these are shown in red dots. The changes are basically made so that the line follows garden boundaries rather than arbitrarily cutting across properties as in the past. The line also reflects the granting of planning permission for housing development off Little Street. In recognition that some areas are of greater landscape value than others, many years ago Northamptonshire County Council designated a number of Special Landscape Areas (SLAs) across the district. As part of the Local Plan Part 2 the Council has completed a review of the landscape of the district. This review considered a number of factors including the distinctiveness of the landscapes, their scenic quality, natural and cultural character and function. For the first time, Sulgrave and its sourrounding landscape are included in this designation. High Speed Rail (London – West Midlands) Act 2017 gained royal assent on 23rd February 2017. The proposed route passes through South Northamptonshire and will have a major impact on the environment and local communities in the plan area. Under the 2017 Act South Northamptonshire Council is a Qualifying Authority with responsibility for issuing consents and approvals in respect of the detailed design and appearance of structures and other elements of the scheme, but not the principle of the construction which is permitted by the Act itself. The Council will expect proposals for the development of the HS2 to have special regard to the landscapes of the route, biodiversity and geodiversity. Any loss to these should be fully mitigated and compensated with opportunities taken to address the shortfalls identified in the Northamptonshire Biodiversity Action Plan and wider landscape enhancements. The use of native species is encouraged as will the enhancement of existing and creation of new biodiversity and green infrastructure corridors and habitats. 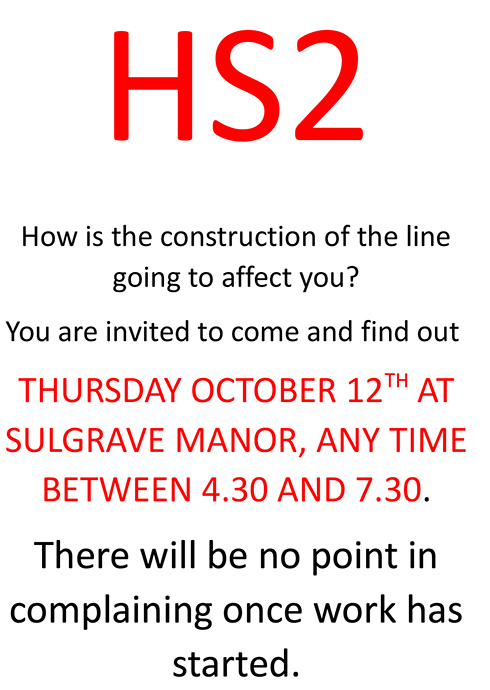 It is strongly suggested that everyone who can should visit the HS2 event to be held at Sulgrave Manor on Thursday 12th October between 4.30 pm and 7.30 pm when an HS2 team will be on hand to answer your questions. In this brief summary of a lengthy and complex document I have attempted to draw out those matters of particular relevance to Sulgrave residents. This should not prevent everyone from making a careful consideration of all the policies and proposals set out in the Local Plan documents and taking the opportunity to comment upon those which are found to be of particular concern or interest. A useful summary of the Plan may be found here. Remember to submit your comments, either online or by visiting a local library, before noon on Friday 10th November 2017. A further public consultation will take place in Spring 2018 and relevant modifications will be made before submitting the draft plan for examination by an independent inspector in Summer 2018. Examination in public and adoption will take place late 2018. This entry was posted on Tuesday, October 3rd, 2017 at 8:00 pm	and is filed under News. You can follow any responses to this entry through the RSS 2.0 feed. You can leave a response, or trackback from your own site.